Tech, academic and government leaders at NSF-funded workshop identify paths to next transformative technologies. 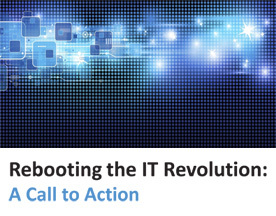 The report is based on a March 2015 workshop supported by the National Science Foundation (NSF) and sponsored by the Semiconductor Industry Association and Semiconductor Research Corporation: Rebooting the IT Revolution. The report details research needed to spur major advances in the science and technology of information infrastructure and to unleash broad opportunities for innovation.